A former Democratic congressman reflects on the nation’s pernicious partisanship and offers some remedies. There’s been no shortage of ink spilled on the deep ideological rift that seems to split the country into warring halves. 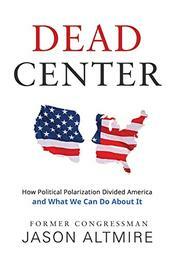 But debut author Altmire, who served three terms in the House of Representatives, contends that the problem of political polarization isn’t chiefly the result of an increasingly partisan electorate. In fact, he avers, the average American is far more moderate than those who typically represent her. Rather, there are systemic reasons why the extreme, most ideologically monolithic voters dominate both the elections and public discourse. Political campaigns pinpoint the most energetic voters—who are also generally the most doctrinaire—and campaign finance laws exacerbate the situation by promoting the outsized influence of Super PACS that operate in the shadows. Closed primaries also disenfranchise political centrists and elevate the status of fringe voters. To make matters worse, studies indicate the profound power of widespread confirmation bias, or the psychological tendency to selectively curate only the information that flatters one’s unshakeable convictions, a predilection reinforced by the news and social media. The author discusses his own experiences with partisan dysfunction, regarding both fundraising and governing, and his participation in the historic vote on The Affordable Care Act is one of the highlights of the book. Altmire suggests several practical solutions to toxic tendentiousness that include limits on senatorial filibusters and congressional gerrymandering as well as requirements for schools to offer more civics courses. He also places a priority on reversing the trend toward low voter turnout, which only enhances the clout of reliably voting ideologues, and the incentive for demagogues to aim their messages at them. Altmire earned a reputation for being a centrist politician, and his philosophical temperance is impressive; it’s fitting that a book extoling the virtues of bipartisanship is itself an exemplar of it. And while many of the author’s proposals cover familiar ground, others are bold and even provocatively counterintuitive, like removing the limits on financial contributions to parties as a means of reducing the influence of partisan donors and increasing transparency. The entire work is written in an unpretentiously accessible style and represents precisely the kind of open-minded public discourse to which citizens should all aspire. An incisive, intellectually thorough analysis of one of the country’s most pressing political problems.